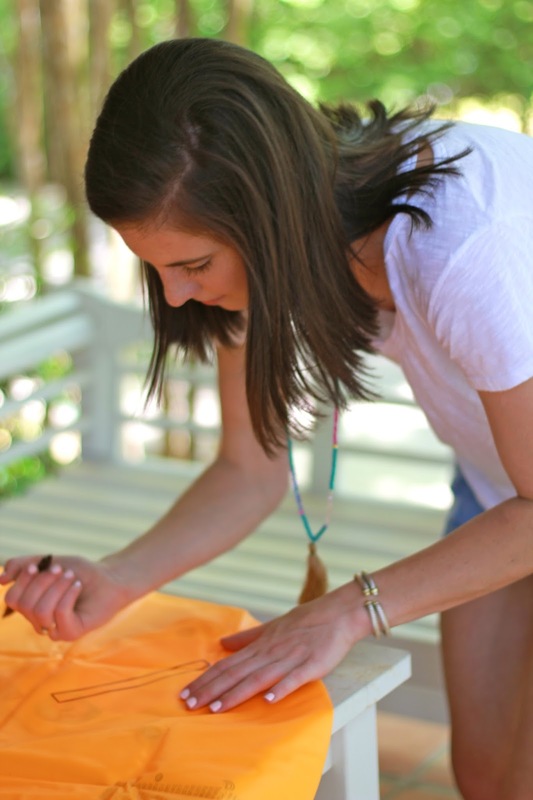 I am so excited for this post because it may just be the easiest do it yourself ever. I've done some other easy DIYs in the past ( tassel cross body + pom pom beach tote) but this one takes the cake for being the easiest. We are talking two supplies (well three if you count your hand) under 15 minutes and ta-da you have the perfect personalized summer pool tube. Fun pool floats seem to be all the trend as of late and if I had a pool you can bet I'd have one (ok, probably more than one) floating around constantly. 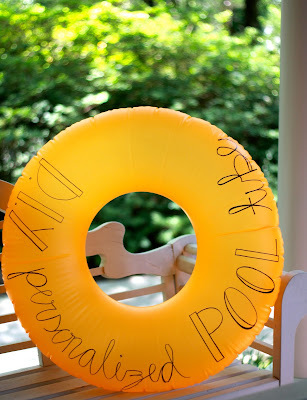 But for those of us without a pool spending that much money on something we have to tote to the beach for a couple of cute pictures and hours of enjoyment only to deflate when retreating home they aren't exactly practical. 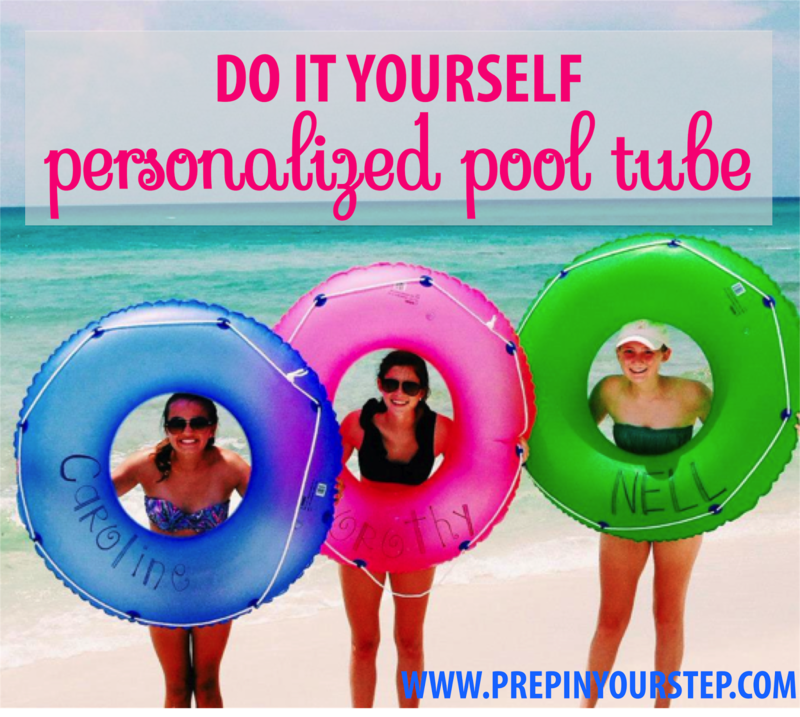 Have all of the fun (and equally as cute pictures) by following this DIY and have no fear of matching anyone else since each pool tube is personalized! 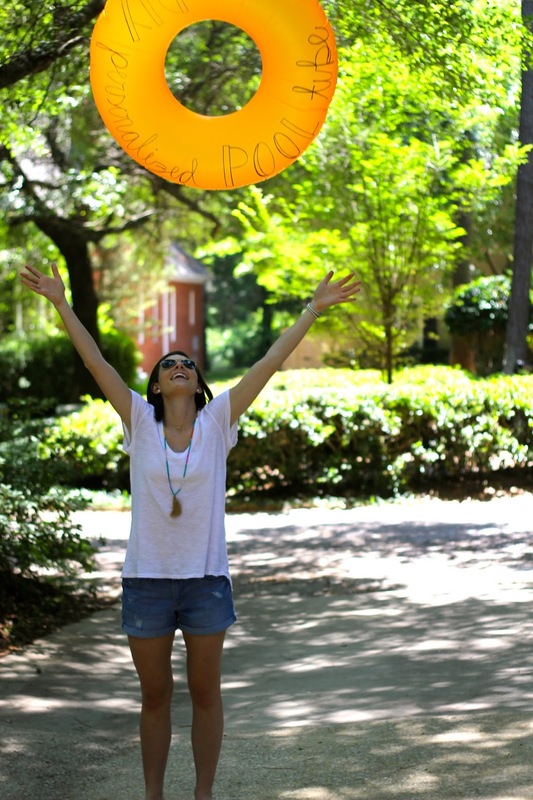 The first time I did this was the summer before my sophomore year of college when two of my friends (Nell and Caroline) and I went to Watercolor for the week. 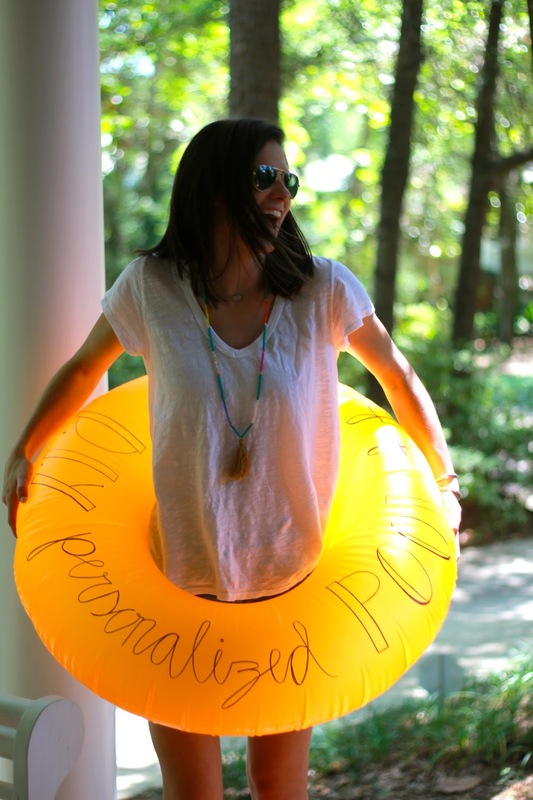 I thought we needed something fun to float about on so I picked up each of us a tube (at Publix of all places) and decided to write our names on it. While we struggled to blow them up and transport them to the beach (think 3 girls on their bikes maneuvering down the sidewalk with pool tubes on their waste while still trying to manage to pedal and that's what we looked like) but we had hours of fun relaxing in the water on them. We even took one of my favorite photos ever with these tubes that gets a spot on my desk every year without hesitation (seen above). 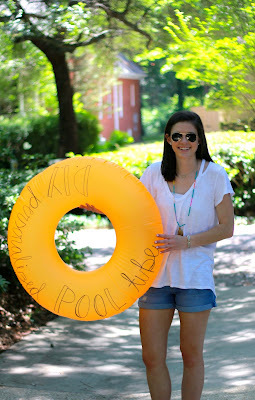 I thought now would be the perfect time to share this easy do it yourself with y'all as you prepare for any beach and pool days to come this summer! There is so much room for creativity when it comes to how you choose to execute your pool tubes and they are the perfect party prize for you and your friends! 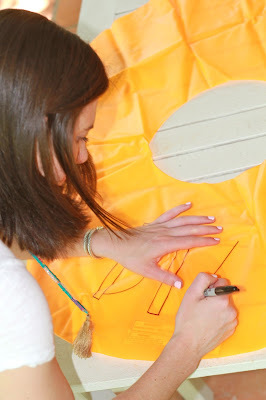 All you need for this do it yourself is a plain pool tube (size of your choice) and a sharpie. I would recommend one sharpie with a regular sized tip and then a jumbo one to go back over the writing to make it bold! It is just as easy as it looks. Take your pen to paper or in this case sharpie to pool tube and before you know it you'll be finished completing your own personalized pool tube. I would recommend that you first practice writing out what you plan to put on the tube in case you want to see how your handwriting may look. For this post I chose to write out the name of my post but I would recommend writing out your name or your friends name on the tubes. I only went over my writing once (and not with a thick sharpies) so if you want the writing to be more subtle feel free to do that but if you'd like it to be bold I'd recommend re-tracing your writing a couple of times! 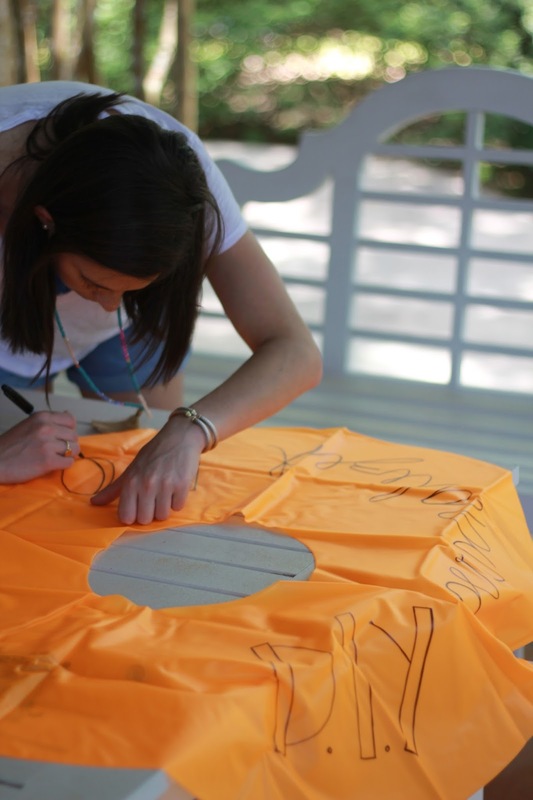 I decided to mix a bold block print with some cursive but that is completely up to your discretion! 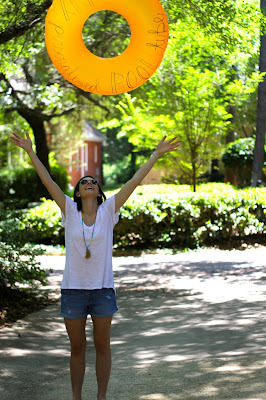 And there you have it my super easy but equally as fun do it yourself! I'd love for y'all to try it out and let me know how it goes! 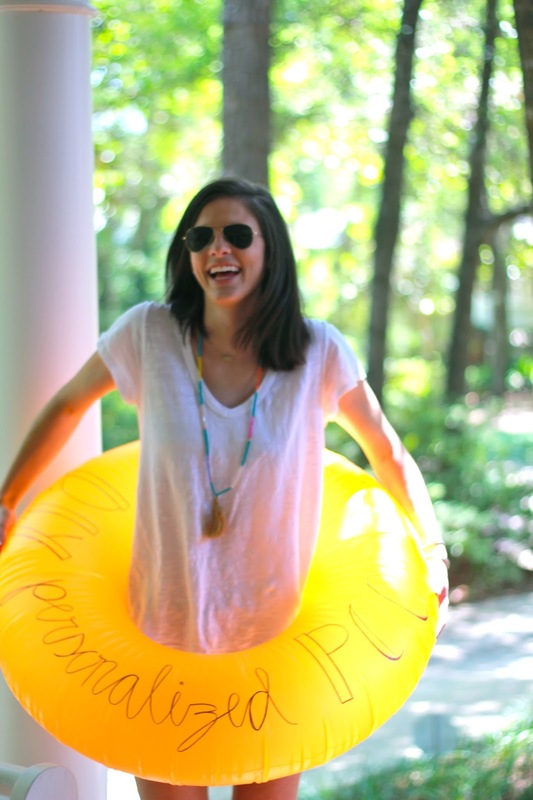 And if you are in the market for any obnoxiously large and fun pool floats these are a few of my favorites! Photos were taken by my friend Nell.